All sessions are identical and include all-you-can-eat Crawfish Boil and Chicken Andouille Gumbo. New beer, guest taps, free snacks and games on free play to celebrate Two Plumbers 1st Anniversary! 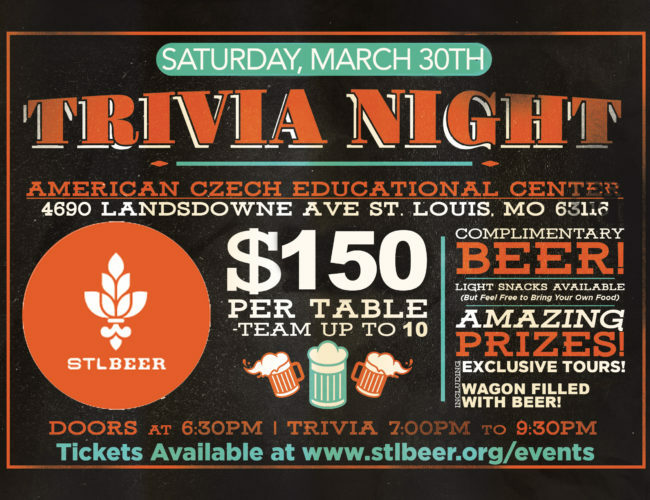 Grab up to 10 of your friends and purchase a table for an evening of trivia, great prizes, and beers all in support of STL Beer! Celebrate the 3rd Anniversary of The Old Bakery Beer Company at the Buzz'd Beer Festival! Come celebrate Schlafly’s largest food & beer party of the year, Stout & Oyster Festival, held on March 23 & 24 at the Schlafly Tap Room! Sample handcrafted beers from the Midwest's finest brewers in support of the Cystic Fibrosis Foundation at St. Louis Union Station.